Includes a free preview of future issues in the collection National War Memorials . For more information, please refer to the Satisfaction Guarantee tab below. If you do not wish to preview future issues in the collection, you may purchase the single item using the 'Individual Item Only' tab at right. Engraving on the Dedication Stone at the Korean Memorial Washington, D.C.
Only five years after the end of World War II, the U.S. once again found itself embroiled in a major international conflict. On June 25, 1950, communist North Korea attacked democratic South Korea. The U.S. sent more troops to join the U.N. troops already stationed in South Korea in defense of democracy. For three years the fighting raged. In 1953, an uneasy peace returned with a negotiated settlement that essentially returned everything to where it was before the war. In 1995, the Korean War Memorial was dedicated honoring the 5.8 million Americans who served during the three-year conflict and commemorating the 54,246 American men and women who died in the war. While the Korean War may have ended decades ago, it still lives on in the hearts and minds of the surviving brave Americans who served in the war, as well as the family members of those who lost their lives. American Mint is proud to offer the gleaming silver-plated United States Korean War Memorial Coin as a way to commemorate our fallen heroes. The Korean War coin is part of our American History collection, whichserves as a remembrance of the people, places, and events that have helped to shape our nation over the years. This AMERICAN MINT EXCLUSIVE coin is plated in .999 pure silver. Minted to thehighest quality "Proof  standard, it features a highly detailed engraving of the Korean War Memorial at the Arlington National Cemetery in Washington, DC. Accenting the obverse is a full-color "Remembrance Poppy, the symbolic tribute honoring all of the men and women who died in the Korean War. Limited to only 9,999 complete collections worldwide, it comes in a protective capsule to preserve itfor future generations. 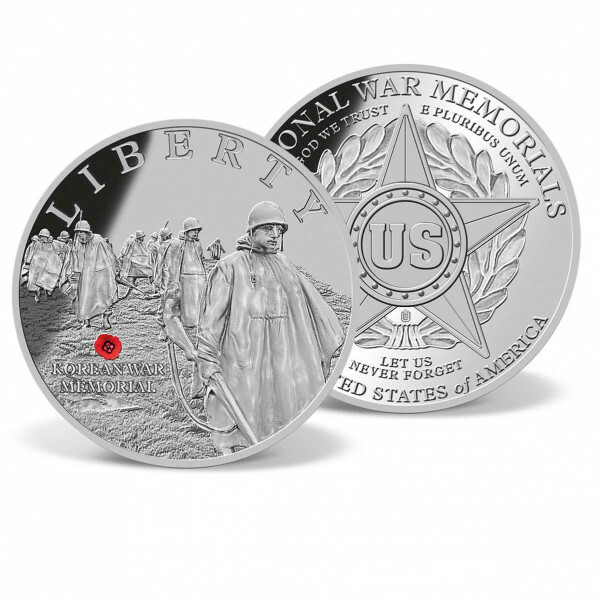 Order Your Beautiful Korean War Memorial Coin Today! American Mint offers the United States Korean War Memorial Coin at a discounted price. To order, addthe item to your shopping cart and complete our fast, easy checkout process.